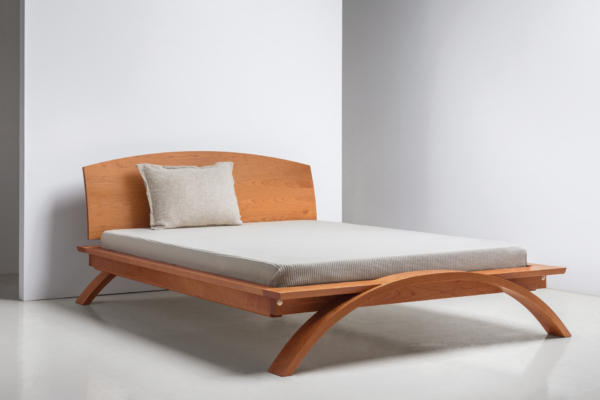 Taking good design down to the fundamentals, the Vita Bed’s simplicity and curved headboard harken back to the Modernist era, while its distinctive sleeping platform recalls long-popular Japanese designs. Despite its delicate appearance, this bed’s loftiness defies its substantial mass. The curved feet – a Vita hallmark– suspend the mattress snugly in a strong solid cherry or walnut base, while its arresting headboard sings the wood’s natural beauty. The Vita Bed achieves its sculptural aesthetic through a combination of elements: arched feet that effortlessly elevate its structure; a functional perimeter platform; a striking headboard of curved cherry or walnut. The visual effect is arresting, forming a vivid focal point for a bedroom of complementary furnishings. The bed’s structure rests atop a pair of heat-laminated wooden arches that integrate in durable, beautiful joints at either end. The integral leg’s unitary structure gives the impression that the bed is afloat, drifting gracefully above the floor. The platform surrounding the Vita Bed rests atop a recessed structural skirt that adds dimension. The frame employs traditional mortise-and-tenon and bolt-through joinery with nickel bolt caps to preserve its long-term integrity. Uninterrupted space beneath the platform is as much a part of its design as its structure, allowing light to play beneath the bed to create a sense of openness. 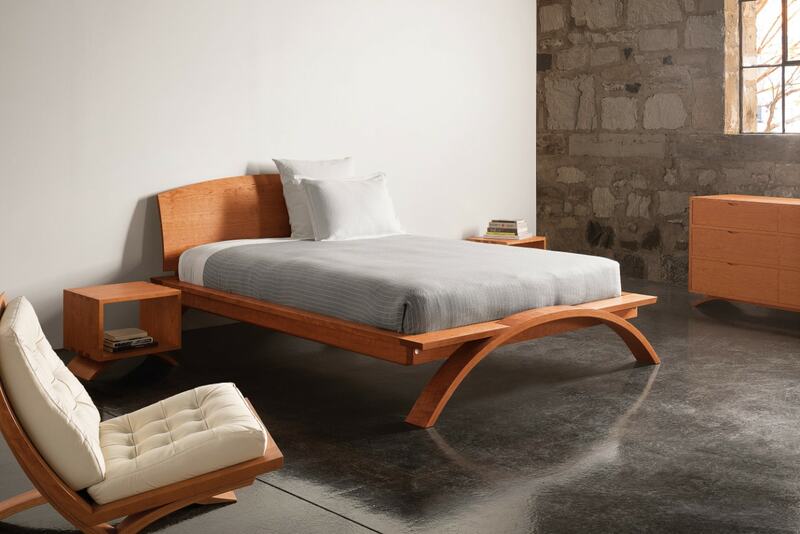 The Vita Bed’s headboard unifies its design, with exposed cherry grains that are reflected throughout the piece. The headboard is affixed to the frame at four points, elevating it above the platform. Canted in a gentle curve, the surface of the headboard provides ideal support for hours of comfortable upright reading.